If you're and engineer, musician, sound designer, producer with samples on many many hard drives, you're looking for a way to organize them and have cool features in an all-in-one app for time stretching and spoting to your DAW directly from the browser... This product is for you! AudioFinder is an audio asset management system, and music production hub. AudioFinder gathers all the most useful tools in one quick and intuitive application, enabling you to be more creative by handling all the time consuming tasks that slow down your music production. AudioFinder can visualize sounds instantly with the waveform overview and preview them at any pitch via MIDI or the built in keyboard, all in real-time. Sounds can even be previewed through your favorite AudioUnits. Speaking of Plug-Ins, AudioFinder features an advanced Plug-In manager and slew of other studio necessities that will make your workflow flow. 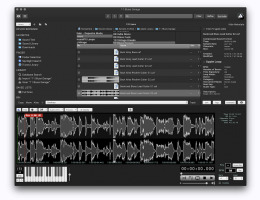 Necessities like Audio Edit with built-in beat detection and tools for fast trimming, fading, slicing and dicing your sounds. You can even convert your audio sample CDs into individual files with just a few clicks of the mouse. AudioFinder invented the genre of sound browsers, by being the first dedicated sound browser on any platform. With a long history of inovation, AudioFinder has consistently broke new ground and with free updates you can expect to always get more value added. Built 100% for Mac OS X using CoreAudio, AudioFinder is PPC and Intel Native. Groundbreaking Mac OS X Finder Integration. Advanced and fast sound searching. Integrated Sample Tool trim/loop/fade editor with beat slicer. Browser, bookmarks, history, favourites, and navigation tools. Play multiple sounds at sound time to explore layering. Instant playback with mouse and MIDI input for pitch control. Peak analysis and pitch analyzer tools. Drag-and-drop integration with Finder and all audio apps. BPM tap pad, reference tone generator, delay calculator. AudioUnit preview playback and processing. Useful built-in DSP operations and effects. High-quality sample rate, depth, and format conversion. All operations available in automated batch processing mode. Auto-trimming audio CD sample extractor. AU/VST/MAS/RTAS plugin manager and AU presets management. Generic sysex transmission and SMF playback. Create EXS instruments with one click. Loads fast, doesn't crash, and light on system resources! Apple Loop and ACID Wav Metadata display. Formats: Apple Loops, CAF, AIFF, AIFC, SDII, WAV, REX, RX2, MP3, ACC, M4A, SYX, MID, FLAC and OGG Vorbis. Download the demo version of Audio Finder HERE!